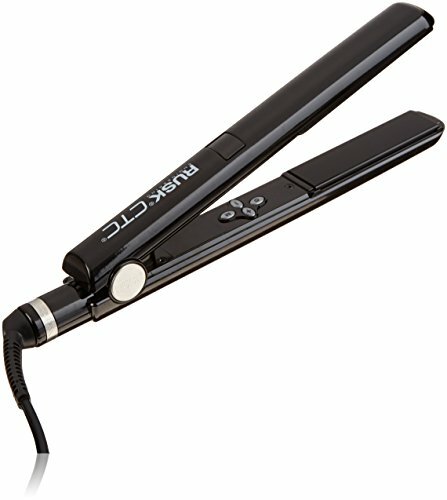 What to Look for in a Flat Iron for Straightening Short Hair? Many people have the misconception that short hair is much easier to straighten than longer hair. While it’s true it may take more time to straighten longer hair, it’s not exactly true it’s easier to straighten than short hair. That’s because straightening short hair presents its own particular type of problems. There is less hair to grab onto, you do shorter strokes and you are working closer to your scalp which is not easy. These are all reasons why you need the best flat iron for short hair when straightening it. How do you find the right flat iron for short hair? Well, you can start by reading these flat iron for short hair reviews. In it, you will find some helpful information and an ultimate buying guide. By the time you are done reading it you will know exactly the type of flat iron you need to straighten your particular type of short hair. The popular hair tool company ghd has made a very basic but effective flat iron with this model. That makes it very simple to use too. It accomplishes this by providing one midrange heat selection that works well on most types of short hair. When you combine this with its versatile 1” heat plate size it becomes a very effective short hair straightening tool. Among its other nice features are its rounded barrel design and it automatically shuts itself off after a short period of non-use. The ghd Professional Classic 1″ Styler is also dual voltage capable so it can travel with you anyplace you go in the world. RUSK Engineering is a big name in hair tools and exceptional working products like this flat iron for short hair are the reason why. It does a great job straightening any type of short hair because of its proprietary CTC Technology (ceramic/titanium) and its 5 wide ranging heat settings (300ºF to 450ºF). It has many other nice features too. These include such things as its stay cool Ryton Plastic housing and its Sol-Gel heat plate coating that makes them extra smooth. This flat iron heats up fast and stays hot the entire time you are straightening your short hair. There are few names in hair tools that are more trusted than BaBylissPRO. Flat irons like this one from them only solidify that reputation even further. It features very advanced Nano/titanium heater technology that protects your short hair as you straighten it and leaves it very shiny. It can straighten any type of short hair thanks to its amazing 50 heat settings (300ºF – 450ºF). Other features not to be overlooked on this flat iron are its slim, lightweight design and its uniquely contoured barrel. It makes this flat iron ideal for adding curls and waves to your short hair too. The 4-year limited warranty that comes with it is a nice added touch too. 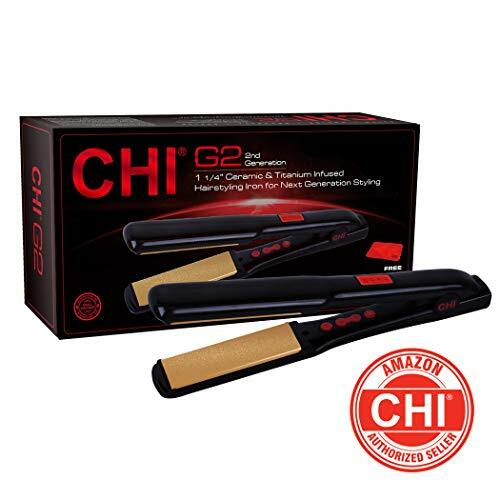 Chi is often known as the gold standard in hair styling tools and this flat iron from them does not disappoint. It has ceramic coated heat plates that are also titanium infused. These plates heat up fast, heat evenly and don’t lose their heat during the short hair straightening process. They also help eliminate frizz and let your hair shine more after it has been straightened too. There are three different heat settings to choose from (370°F, 395°F, 425°F) on this flat iron and it’s ready to use in under 40 seconds. 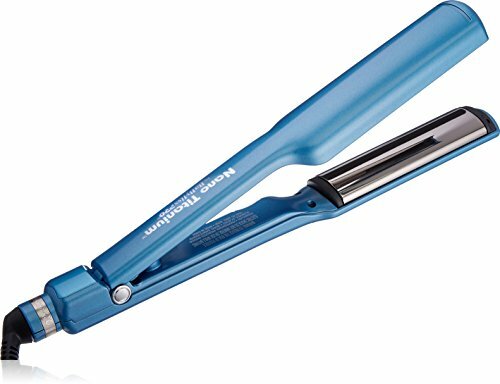 The floating heat plate design also keeps your short hair in contact with the heat plates longer as it passes through the barrel of this straightening iron. This is Conair’s top of the line flat iron. It works very well for the budget-friendly price you will pay for it. Perhaps its best feature is its ultra-smooth heat plate surface. 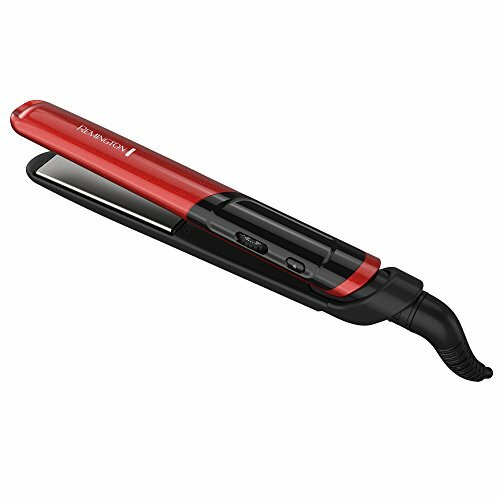 Your short hair will not catch on the plates at all as you pull it through this heated flat iron. These plates also have ceramic coatings and tourmaline crystal infusion. That helps protect your hair from high heat and will help it retain its moisture better too. 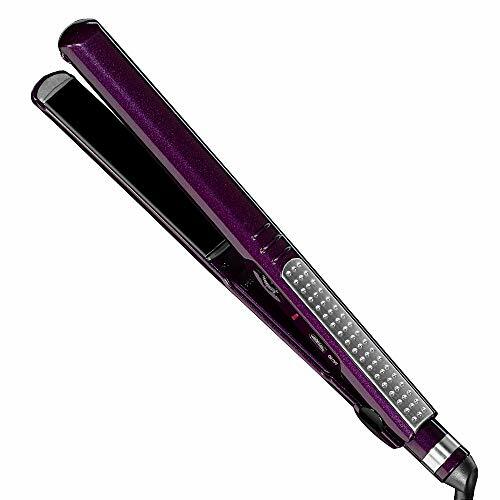 Other good features on the Infiniti Pro by Conair Flat Iron include its rapid heat up speed and its 30 different heat settings (max 455°F). The 5-year warranty that comes with your purchase of this flat iron is pretty amazing too. This is a pretty incredible flat iron from Remington that has many great features for the low price you will pay for it. Many of its features you would expect t0 find on a much more expensive flat iron. This straightening iron is ready to use in seconds and has 30 different heat settings. Its 455°F max heat can straighten even the thickest short hair. 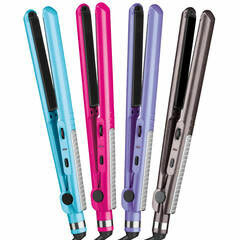 Its slim design and 1-inch wide floating heat plates will really enhance your short hair straightening process too. The Remington S9610 Hair Straightener also features protective silk ceramic technology and has a hinge lock mechanism to keep it safe when it’s traveling with you. As was mentioned in the opening paragraph straightening short hair is not as easy as one might think. Not every flat iron product in the beauty marketplace will work well on short hair. Straightening irons for short hair are definitely not one size fits all devices. Even people like yourself with a shorter hairstyle have different types of short hair. That fact means that not everyone should straighten their short hair at the same heat setting. This is the reason why it’s nice to have a flat iron that has a variety of temperature selections.This is especially true if multiple people in your household will be sharing a flat iron. Make sure the flat iron you choose to use on your type of short hair can be set in the recommended temperature range. These days you will hardly ever find a flat iron that does not have some kind of coating on its heat plates. Here are some of the most popular heat plate coatings and infusions that are found on flat irons that work well on short hair. A short description of they will enhance your short hair straightening process will follow them. Ceramic heat plate coatings promote even heating. That means when you use a flat iron with this type of coating there is less chance that it will build up potentially harmful hotspots. Ceramic heat plate coatings also make heat plates very smooth which helps the short hair straightening process go smoother. If you don’t like waiting around for your flat iron to get hot then you will want titanium to be found in your heat plates. They conduct heat in a way that it builds up very fast so year flat iron will be ready to use in less than a minute in most cases. Some of the biggest problems when straightening hair with high heat are the resulting frizz and hair moisture loss. Tourmaline crystal infusion helps prevent both of these things and it will also add some extra shine to your short hair during the straightening process. This type of heat plate infusion is said to take hair moisture retention to an even higher level than does tourmaline crystal infusion. It will also leave your hair shinier and cut down on static electricity in it and frizz. When you infuse silk into a flat iron heat plate it makes the plates extremely smooth. This is highly beneficial when straightening short hair because it has less chance of snagging on the hot heat plate and getting damaged. The more of these heat plate coatings and infusions you get working for you in a flat iron the better. There is no such thing as overkill when it comes to heat plate enhancements. Floating heat plates offer some big advantages when straightening short hair. One of the biggest problems when straightening shorter hair is getting your hair to stay in contact with the flat iron heat plates long enough to absorb enough heat to straighten them. Floating heat plate designs allow for more hair contact time on your flat iron’s heat plates. You certainly want your flat iron to be easy to use. Look for features that will help with this. These include such things as digital temp readouts, stay cool housings and long power cords with swivel ends. There are some real bargains out there on flat irons but like all products, the better ones can be pricey. Flat irons are certainly not what you would call disposable items by any means. That is why you want to protect yourself by purchasing a straightening iron that comes with a good warranty. The longer and more comprehensive your flat iron warranty is the more peace of mind it will give you purchasing it. Just like bodybuilders don’t train the same muscles every day because these muscles need time to recover the same is true for your short hair. Although high heat is essential for straightening any length of hair even the best designed flat irons still damage your hair slightly during the process. Give your short hair some rest days from the straightening process and it will help keep your hair healthier looking. 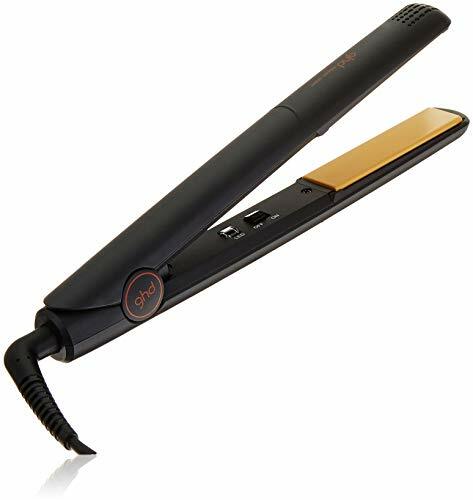 There are some flat irons that are vented that you can use to straighten your hair when wet without damaging it but these are rare and hard to find. 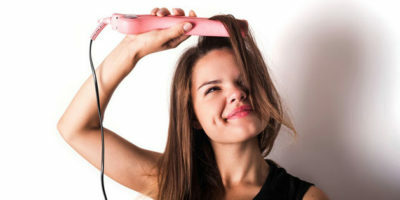 Most regular flat irons pose a high risk of damaging your hair if you use them on wet hair. This is because they trap super-heated steam as you straighten your short hair and it has no way to escape. So in effect, you are overdosing your hair with hit for too long a period of time when straightening it. An “ounce of prevention is worth more than an ounce of cure” is a popular saying that certainly pertains to your short hair straightening process too. Protect your hair as much as possible from the high heat of the straightening process. You can do this by adding such beneficial hair coatings as argon oil or heat protective serum before you straighten your short hair. Ask your own professional hair stylist what they recommend. Most salon professionals agree that it’s not great for you to blow dry your hair right before you straighten it. Why might you wonder? It’s because you risk damaging your hair by giving it two doses of high heat right in a row. The only exception is if you take the time to blow dry your hair on a non-heated setting. Shampoo and condition your short hair the night before straightening it and let it dry naturally before you sleep on it to get the best results. Everyone has a stubborn spot in their hair that just won’t seem to straighten like you want it. The answer to this problem is not going over a half dozen or so times to get it to straighten for you. Making more than two or three passes over the same clump of hair can severely damage it if you are not careful. That then becomes a much worse situation than living with a patch of hair that is not perfectly straight. Question: I have short hair and my friend told me that the wider the flat iron plates I have on my flat iron the better for straightening it. Is that true? Answer: While I am sure your friend meant well that is hardly the case. More of the opposite is true. Smaller heat plate widths will actually do a better job on short hair. When straightening short hair you just don’t have the volume of hair going through wider plates that makes them useful. Smaller heat plate widths make your flat iron easier to maneuver and more efficient when straightening your short hair. Question: are keratin treatments really that beneficial if you straighten your short hair on a regular basis. Answer: The answer to this is a resounding yes. Keratin treatments do the same thing as vitamins or conditioners do for your hair. They help repair it and make it stronger which in turn makes it more resilient to such things as heat damage. Keratin is a natural protein found in hair that is often lost over time; this is even truer when you are styling or straightening your hair with hit. Question: Is it possible to get a salon quality straightening job by doing it myself at home? Answer: Well salon stylists spend years studying and practicing their craft so it is hard to match that at home but not impossible. There are a few things to consider in order to get your hair to look like it has been professionally straightened. One of them is to educate yourself periodically on how to successfully straighten so you keep up with the latest hair straightening tips such as we have provided you in this article. The other thing that is ultra-important in order to get your hair to look great after it has been straightened is to match it up with the right flat iron for your hair type. This last statement cannot be emphasized enough. 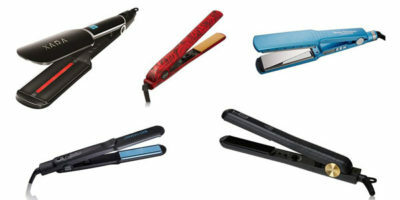 Check out the recommended professional hair straighteners for your hair type and needs! Well, now you know there really are flat iron models that work much better on short hair than others. These preferred flat irons will help you straighten your short hair more effectively and efficiently. 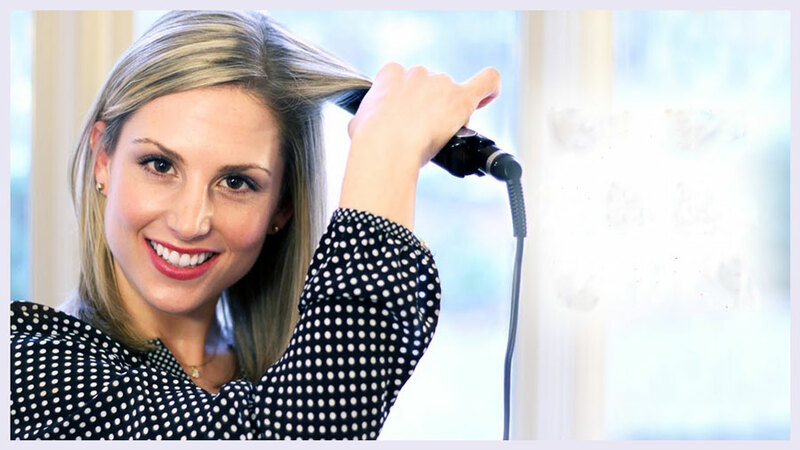 The right straightening iron will help you spend less time getting ready on the days you straighten your hair and cut down on your frustration while doing it. The best flat iron for short hair can do all that and more. When it’s time for you to purchase your straightening iron to use on your short hair make sure you refer to the buying tips in this article. It will help narrow down your flat iron choices. You can also never go wrong purchasing one of the straighteners that we did flat iron for short hair reviews on. As of now, you have all the information you need to make a sound flat iron for short hair buying decision. Getting this flat iron purchasing decision right will really make your life easier and less stressful as you get ready each day.